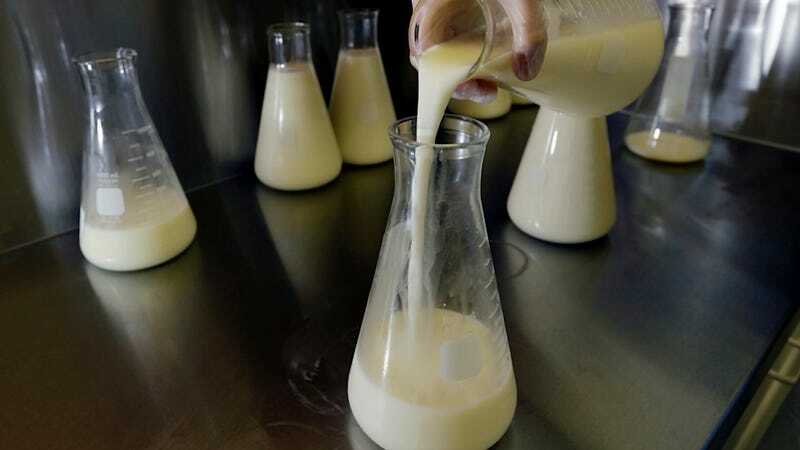 A woman from northern Texas has just obliterated the Guinness world record for donated breast milk by untapping her bounteous milk ducts and pouring forth 86.8 gallons of sustenance. The cup of infants everywhere indeed runneth over. Alicia Richman of Granbury, Texas found that she was producing way more milk than she needed to feed her newborn son. So, naturally, she decided to start socking some of that extra breastmilk away in her freezer, but of course she ran out of room. That's when she learned about the Mother's Milk Bank of North Texas, a nonprofit that provides milk to babies in intensive care whose mothers can't produce milk (a mere three ounces of breastmilk is enough to feed a premature infant nine times). Richman reached the 86.8 gallon mark in March, but she had won the "Most Breast Milk Donated" golden teat long ago — 86.8 gallons beats the previous record by 23 gallons. Look out though, because Richman is determined to pump even more milk into the Milk Bank of North Texas' coffers when she has her second kid.